It’s always nice to see an influential, ground-breaking artist get the respect and recognition they deserve while they are still alive to enjoy it. Country songbird Loretta Lynn released her first single in 1960 and has been going strong since then, still touring and recording now as much as she ever has. Throughout her illustrious career she’s released over 50 studio albums and over 80 singles, with 16 of them going to Number One in the U.S. alone. Coal Miner’s Daughter: A Tribute To Loretta Lynn is the first multi-artist compilation to pay tribute to the feisty singer-songwriter from Butcher Holler and it does an admirable job of showcasing her songs and illustrating her wide-reaching musical impact. With a diverse line-up of tried and true country stars, alt-country songsmiths, a few rowdy rock n’ rollers and even Loretta Lynn herself, Coal Miner’s Daughter turns out a nice collection of covers honoring the iconic living legend. While it’s a vast understatement to just say that Loretta Lynn made huge strides for woman who wanted to sing country music, her impact can clearly be seen in the female country artists who appear on Coal Miner’s Daughter. From veteran artists like Reba McEntire, Martina McBride and Faith Hill to newcomers Carrie Underwood and Miranda Lambert, Loretta’s effect on gender and genre is well represented throughout the album’s 12 tracks. The album is bookended by a faithful rendition of “Don’t Come Home A Drinkin’ (With Lovin’ On Your Mind)” by Gretchen Wilson and a new version of “Coal Miner’s Daughter” by Sheryl Crow, Miranda Lambert and Mrs. Loretta Lynn herself. Lee Ann Womack also delivers a loyal take of Loretta’s first single, “I’m A Honky Tonk Girl.” The grittier, unpolished side of country owes a lot to Loretta as well and Lucinda Williams’ “Somebody Somewhere (Don’t Know What He’s Missin’ Tonight) and husband and wife duo Steve Earle and Allison Moorer’s “After The Fire Is Gone” makes me really want to hear more raw alt-country and folk versions of Loretta’s songs. As much as it may be a little surprising to see band names like Paramore and The White Stripes in the track listing, both have good reason to be included. Paramore’s lead singer, Hayley Williams, grew up just south of Nashville and Jack White produced and played on Loretta’s 2004 album Van Lear Rose and has been a vocal fan of hers for quite a while. In fact, The White Stripes’ live version of “Rated X” is from 2001 and is the B-side from their “Hotel Yorba” 7” vinyl single. 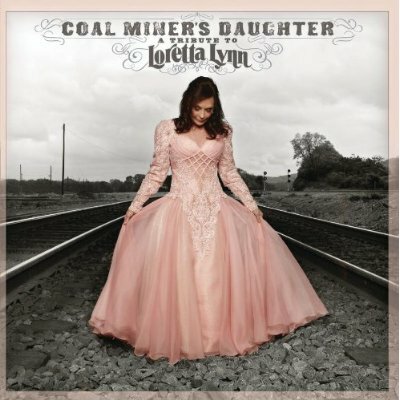 Eventhough “Fist City,” my favorite Loretta Lynn song, isn’t covered by anyone, I really enjoy Coal Miner’s Daughter and I think the artists capture Loretta’s attitude and character really well. It’s a smart idea that no one attempted her more controversial songs like “The Pill,” “Dear Uncle Sam” and “Wings Upon your Horns” because no one could’ve come close to delivering them like she can. But thankfully her unique feminine charm and strong spirit of women’s equality in relationships shines through on tracks like “You Ain’t Woman Enough (To Take My Man)” and “If You’re Not Gone Too Long.” Coal Miner’s Daughter does exactly what you want a good tribute album to do. It provides some fresh approaches to classic songs you already love, while doing it in a way that really makes you want to hear the originals all over again.